"It's likes Daredevil, excepts beings also a Sith Lords. Ands a vampire for reasons." Nothing an honest discussion won’t fix. For better or worse, its the right thing to do. Then again, Miss Lillian may already be prepared for Selkie to develop glowing eyes. Dont know if its the case with Selkie… but ALOT of kids do this on purpose to cause trouble. They dont realize the concequences of what they say and will do things like this because they think its funny or are mad. Kind of like when a child says they hate a parent because they were told No. Not the strong suit of CHILDREN. Honestly, I’m glad to see Lillian taking a measured “trust but verify” approach here. Too many these days would call the police or child services without ever examining the situation in detail first. I have completely heard of this kind of thing happening in real life with small children. E.g. telling on Dad for “drinking and driving” because Dad had a coke in the car. yeah, kids have a way to do/say something without thinking, that is meant entirely harmless but comes out wrong….and sometimes idiots overreact. we had a case like that when i was in primary school, someone freaked out over a drawing of ‘clear’ sexual abuse – which turned out to be a picture of someone milking a cow…the picture only showed the hand on the teat though, so i guess it looked kinda bad, still a few questions BEFORE calling the cops and child welfare and a bubch of other people could have spared a lot of time+nerves. In case of suspected abuse of any kind, overreacting is probably still better than not reacting at all. And random people aren’t supposed to play detective, if you think something is amiss you call the responsible authorities and let them deal with it – seems like the proper action to take. And if you’re wrong, you could destroy that whole family’s life forever. Asking a simple question or two isn’t “playing detective”, it’s just the right thing to do. The police/child services etc should be the ones asking those questions is what I’m saying. And when they find nothing amiss then good, how does that ruin anyone’s life? The trouble is that the ‘responsible authorities’ are often constrained by rules written by other people entirely removed from the specific situation, who did not think about the need for common sense. Yes, it is important not to dismiss indications that something is wrong. But before pressing the alarm button and launching a huge investigative process that, no matter how it comes out, will probably do a great deal of collateral damage, including damage to the child… it is wise to do a reality check and make sure that there really is something worth investigating. The awful track records of police and child services don’t back that assumption up. That kid’s dad will be on watch lists for the rest of his life, for one. Just having his name in the paper as a potential child abuser who “got away with it” has been known to send amateur “heros” with baseball bats after him to hospitalize him in a not-at-all-thought-out plan to “rescue” a helpless child. The child’s innocent confidence that his parents will always be there for him is shattered, having to understand from too young an age that either of them can be taken away from him forever at the ill-considered whim of a random stranger. He’ll have nightmares about the experience of armed men coming to take his dad way for months, if not years. Then we get into the reputations of the entire family with their neighbors and peers, most of whom will only get half the story at best. So yeah. there’s a LOT of harm that can be done with false accusation, even IF (and it’s a big if; that whole “innocent until proven guilty” bit has been pure fiction for decades) the charges are dropped. One time my brother fell down and bruised his right eye, then the next day my sister bruised her left eye. Mom was worried someone would think she grabbed them and smacked their faces together in a fit of rage, but nobody said anything. did they not notice? or was it sort of expected it would happen. IF we ever showed up with bruises it was generally assumed that either we caused it (3 boys punches get thrown.) Or mom had enough and dished em out as required. Most of the adults that would have been around to notice would have known that my brother got his black eye a whole day before my sister did, and that we all ran around outside and indoors a lot. Which, indeed, is how both injuries happened. Mom was just worried about having to explain it to someone who wasn’t as familiar with the situation, like a deliveryman or someone like that. My mom had the same fear with my laundry list of injuries. I broke my right arm falling out of a tree, left arm 3 years later when my brother shoved me from a height while playing “King of the Mountain”, cut head when a lamp fell on it at 7. And my brother wasn’t much better, as he ate as much as I did but looked like he was malnourished – even now he’s 6’4″ and struggles to crack 180 lbs. People usually look at additional signs beyond broken bones or black eyes. Abuse also shows up psychologically, such as being vague and distant when explaining how you got injured and being socially withdrawn. 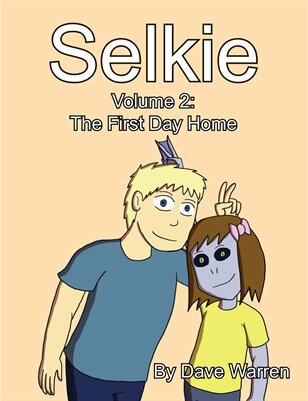 Abused kids usually aren’t happy like Selkie is portraying. This isn’t to say it can’t or doesn’t happen, but by and large, behavior is a major giveaway. Well at least Lillian is asking before jumping to conclusions. That’s a good thing. When I was about 7 we were playing a (probably ill advised) dexterity game and my dad missed and broke my toe. They ended up taking me to the ER because I couldn’t put weight on it, and they asked what happened and I said “My dad hit me with a stick”. Whoops. Sorry dad. Amanda’s attitude seems to have toned down a lot, not just with Selkie but with others as well. Well heck, look at Amanda’s background and history. Kids are actually really good at hiding stuff. Was reading about someone who had broken their arm as a kid and hid it from their parents, it ended up healing wrong and when they finally did find out, they had to have it rebroken and set to fix it. We know Selkie isn’t being abused, but I mean, is it really out of the question a kid who’s being abused might just be happy about being included in something fun? Yep, this. Lillian is very right to double-check here. Can I just say, I *adore* Miss Lillian. She’s good at setting boundaries, strict, but kind and even though she’s fairly certain nothing is going on, she still decides to check up on children, that are technically not her “job” anymore. I love it! She’s a old c-word that needs to mind her own buisness. not really? it’s in her best interest to ensure the children’s safety, and if there is even a slim possibility of abuse, then she has every right to investigate. i think minding other people’s business is her job. Hah, curmudgeon, yeah! But I think she’s properly curious, because y’never know. It is a LEGAL REQUIREMENT that she keep tabs on anyone they placed children with. The parents agree to it when they sign the adoption papers. 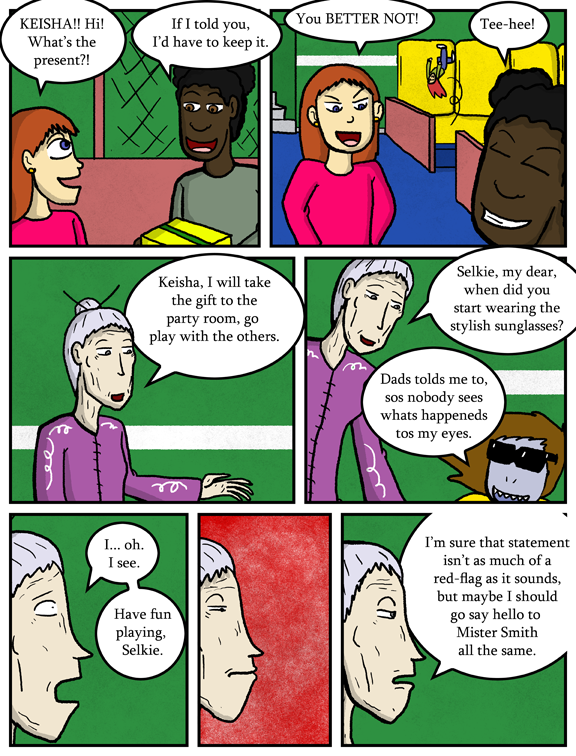 I believe Miss Lillian or the other orphanage worker made that clear in the early parts of the comic. both of which are traps loooots of people fall into. Wouldn’t Lillian be considered part of child services? I thought that foster homes or orphanages would be a part of that anyways, since a child might be moved to one such location if the situation deems it necessary. Not that I am positive Lillian thinks that Todd harmed Selkie. She knows the situation about Selkie’s people better than most of the adults that Selkie’s run across. She might just be concern because this a new thing that is happening and does not know what it means in terms of Selkie’s cover. Depends on the state and county, some orphanages are state run while some are privately run through organizations, but seeing as Mr. Brown left her there, I would assume that its a state run orphanage and that in tern, Lilian is a state employee. Also, they tend to keep doing follow ups on adoptions for a while after the child goes to the new home, so Lilian is just doing her job in following up on a potential issue with her charge. On page one the sign over the door says “Municipal Orphanage” so it’s a city-run orphanage. 99% she leapt to the obvious conclusion of ‘there are bruises’, simply because of experience dealing with abused children (example: Amanda). She keeps in mind that there can be 1000 other less-likely less-obvious completely innocent explanations, but she’s very, very right to go check. God bless her. Probably not a bad idea, Lillian. Does Todd now know more about Selkie’s people than Lillian does? Does she know about the village? I wonder if he will struggle to avoid revealing classified stuff, or if he just won’t care. I think people are forgetting that Lillian may not be Selkie’s guardian anymore, but still responsible for making sure any child that leaves her orphanage is properly taken care of. Moreover, Lillian knows that Selkie isn’t human. Which means Lillian knows that there are a LOT of things that she doesn’t know about Selkie’s biology. Her eyes could just changing for a naturally healthy “non-human” for all she knows. Which is why she’s going to simply going to ask the obvious question about the sunglasses and not assume the worst case scenario. She’s being smart and responsible and doing nothing wrong here. Really wish there was a limited edit function on here. At some point Lillian will cease to be a Social Worker and Guardian and will just end up being a surrogate Grandma. My daughter has two of these, nannies that took care of her when she was younger. We still keep in touch, and she’s in University now. More Grandmas are always better. Your kid should have several spares. Leonard Nimoy famously volunteered to be an Honorary Grandpa to anyone who needed or wanted one.